I have finished with raising the Hurley, and am visiting my Dad in Gainesville, Fl, getting ready to head north gain. I contacted a local folk group and go to a jam session at a house. I can’t show much of the jam since I don't know the other people, but there was a point late in the evening when most folks went outside, but of course, the dulcimer doesn’t move, so I stayed inside. 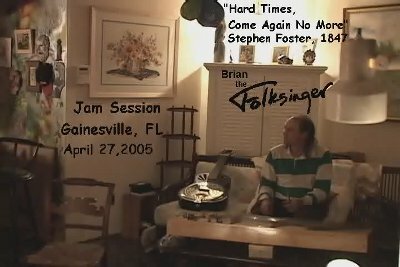 I was talking with a guy about Stephen Foster, and I played this song. You can hear him coming in on the chorus occasionally. I can still remember recording this song in a commercial studio for a CD, back in the early 1990s, but the sound engineer convinced me not to use it, saying it was "too sad". Perhaps it is a simple example that some people just can’t understand this song, while for others it means so much. I love this song. I have lived a hard life, and have always appreciated how hard life has been and is for lots of people, more so than I. But I have always found some solace in reading about the lives of other artists, and the stuggles they went through. This song means so much for me, which is why I sing it, as it says so much I have lived. It expresses so clearly the simple sorrow and resignation of those for whom life is not a easy path, both a reflection of his time and beyond time, the poor and sick, the hard world that cuts lives short all too early all too often, and the pain of beng sensitive and emotional, being an artist, in this brutal world. It even expresses the inner conflict of the entertainer, who is there to make the fun-seeking crowd laugh and dance, and forget the sufferring that many artists see and know too well, and often have lived, and can’t forget. Though as I tell people, I play music because, in the middle of a song, I forget it all, and that the role of a great song is to take the hard truth, and while showing it clearly, do it beautifully, a soft coating over a thorny reality that is hard to swallow otherwise. Perhaps this explains in some small part, the phrase I so often use to describe what I have found and even seek, the "terrible beauty", of life, in life, as a life. This entry was posted on Monday, March 22nd, 2010 at 2:55 pm	and is filed under Music. You can follow any responses to this entry through the RSS 2.0 feed. Both comments and pings are currently closed.